Jenn and Barry decided on a destination wedding because they wanted a vacation together with their loved ones. It sounded far more fun to have a destination wedding instead of a traditional wedding. Jenn said, “Not only does everyone get to vacation, but they also get to watch us get married”. Together with their Destify agent, Ann, they sifted through several resorts until finding the right one. They chose Dreams Palm Beach in the Dominican Republic. Not only did the resort sound like a great family-friendly property, it also offered incentives, like money back when you booked so many rooms. With a year in advance, they secured their wedding date and Ann created their wedding website where guests could place deposits. They began planning with the coordinator with 6 months to go and finalized everything around the 3-month marker. Once on site, the couple met with their coordinator to go over late minute details. They selected the Garden Gazebo because it had the tropical feel they wanted without having to put their feet in the sand. After all, Jenn wanted to wear heels and Barry wanted to wear blue suede shoes. They both looked stunning and Jenn said, “Our wedding day was perfect”. 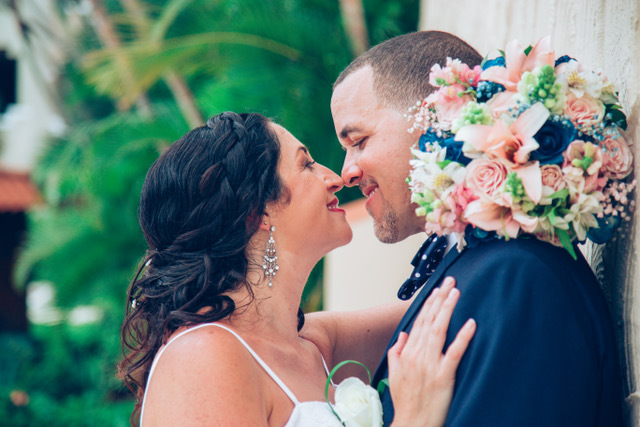 During their 4pm ceremony the couple both shared vows they had written themselves, which caused them to laugh at some parts, and cry during others. A cocktail hour followed, and then their reception which featured delicious food and toasts. The couple partook in a wardrobe change and met their guests at the resort’s disco where everyone danced until the club closed. The entire wedding group continued to celebrate together after the wedding day, venturing out for dune buggy excursions and an ocean catamaran cruise. The couple agreed that their wedding couldn’t have gone any smoother, and they highly recommend using an all-inclusive resort for your wedding. You simply get so much with your wedding package. They loved that their resort included everything needed for their wedding, and for their families entertainment too. The ceremony was magical. Just being together and dancing with everyone was perfect.